Here is this week's statewide football poll, as voted on by the members of ESPN NH's Friday Nights and Nashua Telegraph sports dept. Not much movement among the top 10 teams this week. Exeter retains the top spot, after their thrilling 35-34 overtime win over Winnacunnet on Saturday. Not much movement in the top 10 again this week, as the top 7 teams are ranked in the exact same order as last week. 1) Bedford - I've had them #1 for the past couple weeks, and they beat Londonderry last week 19-0. No reason to move them down now. 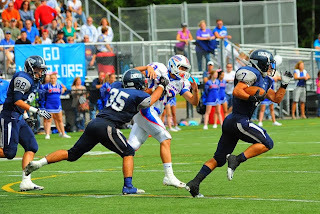 2) Exeter - Excellent football game on Saturday between Exeter and Winnacunnet. Exeter wins by an extra point in OT to hold on to the #2 spot on my ballot. 3) Concord - Another impressive blowout win for Concord in week 3, beating a previously 2-0 Merrimack team 55-0. These guys are for real. 4) Nashua South - I had them in the #4 spot last week, and they handled Timberlane 38-13 to maintain that ranking. 6) Winnacunnet - They actually move up one spot on my ballot with their loss to Exeter on Saturday. I had Keene #6 last week but they lost to BG, who Winnacunnet had already beaten. So you have to put Winnacunnet ahead of BG and Keene, plus you can't discount the Warriors much for a 1 point OT loss to the team many have ranked as the #1 team in the state. 7) Bishop Guertin - Impressive win for the Cardinals last Saturday night over a very tough Keene team. They're now 2-1 with the only loss coming on a last second field goal to a Winnacunnet team I have ranked #6 on my ballot. 8) Trinity - Trinity maintains the #8 spot on my ballot by crushing Lebanon 42-6 last weekend. Next up: Plymouth on Saturday at 4:30. 9) Plymouth - Plymouth or Trinity, who's better? We'll find out on Saturday. Plymouth beat Kennett 42-0 last weekend. 10) Keene - Don't be fooled by their record, Keene is hands down the best 1-2 team in the state. Both losses have been close, hard fought battles to top 10 teams. Spaulding is right on the cusp of the top 10. Ironically, Spaulding and Keene play against each other this Friday. The winner gets a top 10 ranking next week, and more importantly improves their chances for a playoff berth in D-I.